While wiping and deleting information temporarily erases the data, the hard drive is not visually altered making it impossible to identify wiped hard drives from those that aren't. Erase It Clean™ hard drive destruction allows you to see your hard drives being disposed of and the assurance that no data will ever be retrievable. Visual identification as well as a certificate of destruction will identify hard drives that have been professionally destroyed and sanitized. A detailed report listing each unique serial number giving you the assurance that each device is accounted for. Data destruction compliance to all laws within your industry. Web access to see which drives were destroyed. Provide you with certification of destruction. 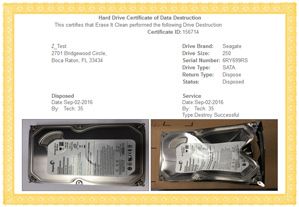 A certificate of data destruction for all serviced drives. This along with a detailed report listing each unique serial number gives you complete accountability of each digital media device. 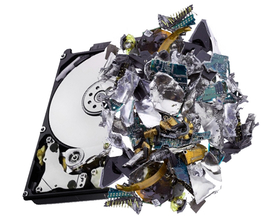 Erase It Clean™ physically destroys hard drives which bends, breaks and mangles the hard drive and its internal components including all data platters. The data platters are bent and separated from the hub, the hard drive housing cracked, the PC board broken and the read/write heads mangled.